Well, here I'm at it again. Bye Bye America. 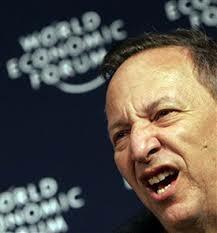 The latest is occasioned by Larry Summers emerging as favourite for the position as Chairman of the Federal Reserve. Just to be clear, Summers is incompetent, corrupt, a notorious bully, personally loathsome and played a central role in just about everything that contributed to the catastrophic financial situation America finds itself in today. Bullied and threatened CFTC Chairman Brooksley Born so that the derivatives time bomb, now hanging over the world like the Sword of Damocles, could explode in size, free of supervision. Gave advice (and also harried and bullied to get his way) that directly lead to the housing crash and that subsequently landed the cost - $200 billion and climbing - onto the US taxpayer. There's plenty more if you want to check it out. But essentially this guy is a psychopathic financial terrorist, with a record of almost unrelieved failure, except when it comes to looking after his cronies in banking and academic circles. (Said cronies by the way are almost always Jewish. I'm starting to see them in my cornflakes now). In this he reminds me of Henry Kissinger, a political terrorist and war criminal. We'll know America is on the way back when their likes are swinging from lamp-posts. And now he's the leading candidate to run the organisation that runs America. And why, or is this a silly question, does the Chairman always seem to be Jewish? You know, they make up only 2% of the population. I have a good idea. Why not save all the messing and give it to Loyd Blankfein or Jamie Dimond? After all, they'll be the ones making the real decisions for the Fed. PS, if you do check up further on this degenerate psychopath, you'll frequently come across plaintive questions on the lines of 'why did Obama give him such a prestigious job?' Just in case you're wondering, Obama did not give him a job. The Real Government did, and duly informed Obama along the way. Oh dear. It seems that once again anti-Semitism is growing. And apparently it's all the fault of that darned Internet thing. I actually laughed out loud on seeing Abe Foxman plaintively recall pre-Internet days when 'anyone who wanted to find out about The Holocaust™ could just pop down to the local library where there'd be 100 books giving all the facts he could need'. Sure Abe, absolutely. Not like now where he'd go to the Internet and be bombarded by hate-facts wherever he looks. Once again, by the way, we see the one unchanging characteristic on Jewish assessments of anti-Semitism: The possibility of its being driven, even in part, by Jewish behaviour is just not considered, even as a possibility. I suppose they're going on Freud's (Fraud's?) analysis, whereby it's a clear indication of a mental disorder. Ok, I admit it. I'm becoming a bore on the subject. But not a day goes by in which the spiralling degeneration of the USA towards Turd World status doesn't blow my mind. The economic side of it is just one example, of course, as is the programmed reengineering of the country's racial makeup. But the Mugabe-like financial profligacy, the blatant and unapologetic ignoring of legal and Constitutional constraints, waging undeclared wars, grotesque forms of nepotism, plummeting educational standards, and most of all the acquisition by the state of powers which arguably rival those of the USSR. Then there's the media which is just a mouthpiece for whatever regime is in power, while behind that regime the Real Government operates with indifference to the people's needs. Add in what appears to be the general lack of criminal accountability and you have..............Mexico. Or Brazil. I could go on and on. What really staggers me is the speed with which it's happening. We're talking about a country being fundamentally transformed in the space of a couple of generations. I personally have never seen anything remotely like it, even historically. What was, allowing for all its faults, the world greatest country is breaking down before our eyes. A somewhat trivial development is the catalyst for this rant. But trivial events can be very revealing. 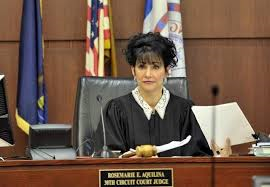 I'm referring here to the action of Michigan County Circuit Judge Rosemary Aquillina (a 'wise Latina' presumably) who has refused Detroit's bankruptcy request. She gave as her reasons that it would be 'cheating' staff and pensioners and - wait for it - 'it’s also not honoring the President'. Now I'm not familiar with American bankruptcy laws, but I do know that every advanced economy has a set of strict and complex provisions that governs the eventual decision. Detailed and complex technical arguments are weighed by specialist judges before a verdict is arrived at. It has to be that way. I ask, has this, obviously AA appointed woman, any legal knowledge at all? Because this decision and its rationale are pure Africa, or Latin America, or Russia. To hell with the laws, such as they may be, you decide in favour of 'your guy'. You take every opportunity to curry favour with El Presidente (this judge forwarded her ruling to the White House!!). America is ceasing to be a nation of laws - imperfect and all as that has been in the past. The ramifications of this are absolutely profound. Has your average American any awareness of the existential impact of these developments, or has his programmed dumbing down been so successful that it's just sailing past his eyes? I fear that things have gone too far. Demography says that America will be majority black/brown with a generation or two. Just like Brazil, which I see as the closest example of America's future. I used to be an avid New Statesman reader, a long long time ago. But I still tune in to see how the enemy is thinking, so to speak. A recent article caught my eye: Let's open Europe to immigration. My first reaction was, you mean we're not doing that already? Anyway, the writer goes on to regurgitate a litany of boilerplate propaganda. To wit....our continent needs the contribution of immigration to escape the perpetual weakening of social security, the raising of retirement age, and the shrinking of pensions. It would, apparently galvanise innovation, no less. At the risk of quibbling, how exactly do millions of uncivilised, illiterate, unassimilable, welfare dependent parasites manage to bestow such benefits on us? Alas, the author does not enlighten us on this rather important point. But he does warn us, and this sent a shiver down my spine, that the future of our continent and the future of democracy in the world are at stake. And who is the author? One Benjamin Abtan, President of the recently formed European Grassroots Antiracist Movement - EGAM. Mmmm...... Let's do a little digging and yes. Of course. Ben is Jewish. Quelle surprise? As you all know, I've made strenuous efforts to identify a critical mass of 'good Jews' out there. There may well be, and I hope there is. But there is no doubt whatsoever that our destruction is being masterminded and managed on an ongoing basis by Jews. You will have guessed immediately that the only person I could possibly have in mind here is the delectable Rachel Jeantel, the star witness for the prosecution(!) 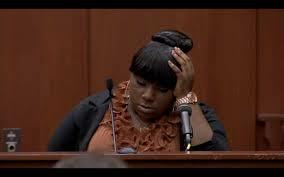 in the Zimmerman case. That she was even left take the stand was in itself ample testimony to the paucity of the prosecution's case, the taking of which was nothing short of scandalous. Even more scandalous were the interventions of the 'forces of law and order' especially those of Eric ('My People') Holder and the prosecutor herself, who, almost unbelievably described a man duly acquitted by court of law as a 'murderer'. 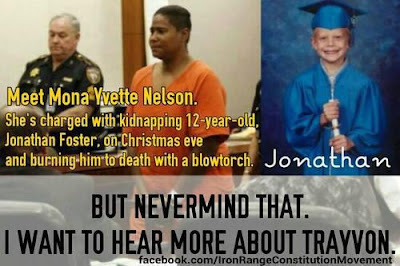 The speed and depth of America's decent into Third World status just beggars belief. After her catastrophic performance on the stand during which she repeatedly perjured herself and inadvertently assisted Zimmerman's acquittal, you'd imagine they'd hide her away for all time. Not a bit of it. They're now trying to make her a TV star. Watch and listen as the audience of (White) drooling slobbering sycophants hang on and applaud her every grunt. But one member of the audience was correct in claiming that Jeantel represented 'an authentic voice for the black community'. Yes indeed. This surly, semi-literate, incoherent, borderline retarded welfare-dependent waddling mountain of pustulence sure does make a perfect representative for that, ahem 'community'. I see her as the next anchor for The View. Will Whites never learn? Here's a simple truth and it applies in every case: If you offend against PC orthodoxies and the Thought Police decide to come after you, apologies and retractions will do you no good. In fact they only seem to whet their appetites for blood. The Paula Deen 'offence' is so laughingly trivial that even in these insane days the repercussions appear grotesque. Yet she's been hung, drawn and quartered. If you can bear to watch this stomach-churning interview with Matt Lauer you'll see her recant, apologise, cry, slobber, prostrate herself before the gods of political correctness. But all to no avail. One blow after another was delivered until she had nothing left. Wouldn't that be lovely? 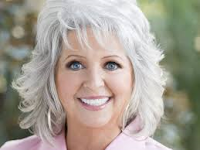 And whoever said it wouldn't be any worse off than Paula Deen. There are many Americans that I know who genuinely attribute benign motives to the Real Government's clamping down on private guns. It's to reduce all those killings. See? Well no, I don't see at all. It would make some sense were the number of murders increasing at an alarming rate. On the contrary, the numbers are decreasing at a dramatic pace, down by almost one third in less than twenty years. 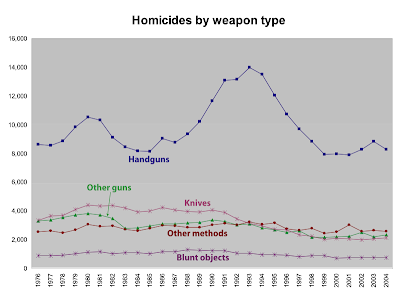 According to FBI statistics the downward trend continued since 2004 albeit at a much lower trajectory. 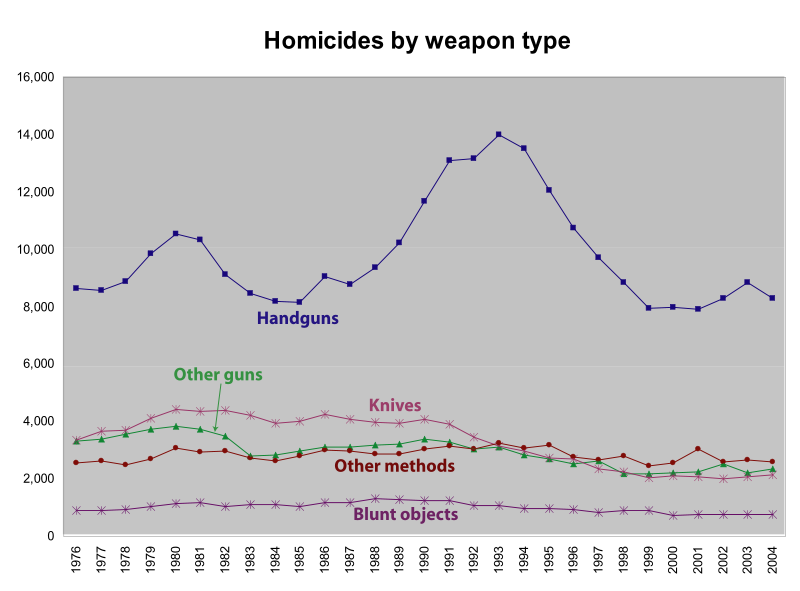 There were only 8,000 gun murders in 2011. And of course, thankfully, the vast majority of such crimes involve blacks and Hispanics. So why the dramatic, unprecedented project to seize the guns now? I think all readers of this blog fully understand why. This post is related to the one on Pamela Geller and of course this one. I realise that raising it yet again will elicit a response similar to that of poking a stick into a nest of particularly peevish hornets. I'm referring of course to the issue of whether there are sufficient 'good Jews' with whom Whites can make practical common cause, at least on some issues. Specifically I'm referring to an article on immigration printed in The Jewish Forward. Its title (Jews Unite Behind Push for Immigration Reform: Ethics and Self-Interest Drive Unusual Nationwide Effort) would appear to confirm all our worst suspicions. As indeed it should. But now I raise again another development I've noticed: The disparity between reporting/editorial on one hand and reader comments on the other. As I've said, they're like two different worlds and provide cause for considerable hope. And in fact readers of The Forward underline this observation in dramatic fashion. Because the comments are almost uniformly hostile to immigration 'reform' and the misleading premise of the article which assumes a unified Jewish voice on the subject. And remember The Forward is read by 'progressive' Jews, the most likely supporters among the Jewish community for this initiative. So I'll say it again: We need to be careful not to throw out the baby with the bathwater. I know, and most of you know, that the war on Whites is essentially a Jewish enterprise. But as this example suggests, Jews are far from united on the goals. A Jewish friend of mine, who by now more or less accepts my position on 'the war on Whites', made the point that lumping all Jews together on this would be like blaming all Americans for the depredations of the so-called War on Terror. Pam, I see you and Robert Spencer have been banned from entering Britain. It's most unusual to see a Jewish activist treated so - in fact it's almost unprecedented - but my guess is that you've been banned because your focus is on the Religion of Peace, and the catastrophic impact of the arrival of millions of these inter-bread, violent, ignorant, intolerant parasites into White lands. I laud you and your efforts, and by the way, you still look hot. But Pam, I notice that you adduce as the reason for the ban 'my principled dedication to freedom. I am a human rights activist dedicated to freedom of speech....' Well now, that's not quite true. Like the 'liberals' (ha ha) you despise, you are indeed passionate about free speech. Providing it supports your position. Otherwise it's banned. I know this, you see, because I have tried to comment on your blog (Atlas Shrugs) on a number of occasions. I had two objectives: First to commend you on your fight against the Muslim invasion, but second to point out that said invasion (together with that from Africa) has been brought about largely by Jewish agency. Strangely enough, not one of them was published - they were banished into the ether. Don't you Pam, as a ' human rights activist dedicated to freedom of speech' find this a bit contradictory? Anyway, keep up the good work and I hope the pussies in Britain change their (weak) minds. I realise that not many people are really interested in who masterminded the 9/11 attacks. But on the off chance that you are one who is, well, this is the guy. He was also former Comptroller at the Pentagon (the guy who looks after the money) during whose time the sum of two thousand three hundred billion went missing, widely believed to have ended up in Israel in one form or another. Sadly the incriminating evidence was destroyed in the 911 rocket attack on the Pentagon. Since then he has gone from strength to strength. The theoretical foundation and strategic positioning for the whole operation was provided by Philip Zelikow..............who was recently appointed to a high position to the Intelligence Advisory Board. Zelikow describes himself as an expert in the “creation and maintenance of public myths.” He defines “public myth” as a “public presumption” about history that may or may not be true, but which nevertheless exerts a powerful influence on public opinion, and through that influence affects history. America is in safe hands. 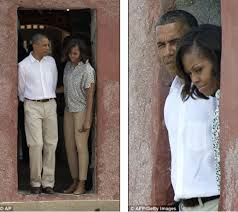 "Obamas Pass Through Door Of No Return"
My heart leapt! Had the Pres and the First Ho' been transported out of our sight to another universe, never to reappear? Alas no. I had misread the heading which actually said they had just visited said door in Senegal, through which slaves passed before they stepped on to the boat taking them to America. Now, unless you've been living in a cave all your life you'll be aware of The History Of Slavery, where the Evil White Man captured Africans, taking them from their blissful tropical paradise, where they lived in perfect harmony with one another and with nature, transporting them to a life of misery in America. In fact so much effort has been spent drumming this message into you that they didn't get around to telling you that the slaves were turned in to the traders by fellow blacks, that Jews were up to their necks in this trade, or that slavery has always been practiced in the Muslim world, right up to the present day in fact. But hey, why let the facts get in the way of a good story? And talking of good stories, it seems the eponymous Door, and the building in which it's set, may not be all they're cracked to be. In fact I can claim some credit here in that it always surprised me that the fiendishly cunning White Man would build a slave house on a rocky promontory far from where any ship could embark the travellers. And now it seems that most historians in the field believe the building, far from being a slave house, was a store, and that The Door was nothing but a garbage shute. Now, were I an unkind person I'd say that being photographed in a garbage chute on the way to the trash heap was an appropriate metaphor for Obama. But I'm not that kind of person so I'll charitably let it pass.